The Clarence House Hotel enjoys an excellent position on the Esplanade with views from South Beach over Caldey Island and St Catherine's Island Fort across the bay to the Gower Coast, North Devon and Somerset. A passenger lift provides easy access to the bedrooms which are all en-suite and equipped with tea / coffee making facilities, individually controlled room heating allows you to to control the room temperature to suit yourself. 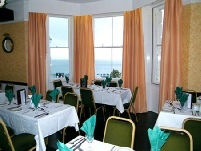 The hotel has been owned by the same family for over 50 years and offers an excellent standard of cuisine in the attractive ground floor dining room. Attention to detail has always been the big attraction with this hotel, every member of staff will offer any assistance required to ensure your stay is a comfortable one and the hotel owners strive to offer that warm and friendly atmosphere which can only be associated with a traditional family run hotel. Your holiday will include return coach transport, accommodation, breakfast & evening meal with a choice of menu, various evening entertainment plus two included excursions taking in some of the best scenery of the Pembrokshire coast and visiting St Davids, Saundersfoot and the old market town of Carmarthen. Tenby is a delightful little harbour town and seaside resort, and it would be difficult to find a setting more picturesque. Its hilltop position led to its early settlement as a Welsh stronghold, which was replaced in medieval times by a Norman Castle and walled town. Part of the town walls survive to this day and are an attractive feature at the entrance to the old town. Until quite recently known as "Little England beyond Wales" this is a rather anglicised part of Wales. 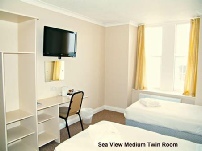 From the early 19th century Tenby became a fashionable holiday destination for both the Welsh and the English, and its attractions to the holidaymaker are just as obvious today, with the fantastic beaches stretching to the north, the west, and the south of the town. If you like good beaches you will love Tenby !